Juvale's set of plastic containers with lids is the perfect solution to your food storage and preservation needs. Whether you are preparing a large take-out order, saving leftovers from dinner, or packing lunch for your kids, these plastic food storage containers are great for the job. The wide temperature resistance of these containers allows you to safely reheat your food in the microwave or store them in the freezer. Made of Polypropylene that is rugged and resistant to various chemical solvents, acids, and bases, these deli food containers are safe for long time use. They are also recyclable through most curbside programs, making them the greener, more eco-friendly choice. 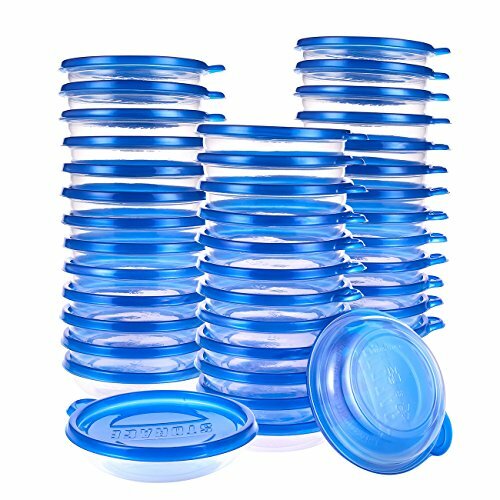 40-PACK PLASTIC FOOD STORAGE CONTAINERS: Set includes 40x Clear Plastic Containers with Blue Lids for storing take out, left-over food and soup. FOOD GRADE MATERIALS: Crafted of category #5 plastic, PP (Polypropylene), a thermoplastic polymer that is known for high heat resistance. Complies to FDA standards and is BPA free. MICROWAVE, FREEZER, DISHWASHER SAFE AND LEAK RESISTANT: Containers have a heat rating of -4 degrees Fahrenheit (-20 degrees Celsius) to 248 degrees Fahrenheit (120 degrees Celsius) and is safe for heating in the microwave, preserving in the freezer, and washing in the dishwasher. Air tight lids prevent spills and ensure contents stay fresh. REUSABLE, STACKABLE, RECYCLABLE: These deli food containers are rugged and can be used and reused for a long time. Pack your lunch for school or work and store leftovers with them. They are stackable for convenient storage and are recyclable through most curbside programs. DIMENSIONS: Each container measures 5 inches in Diameter x 1.3 inches in Height and holds up to 9.5 fluid ounces.